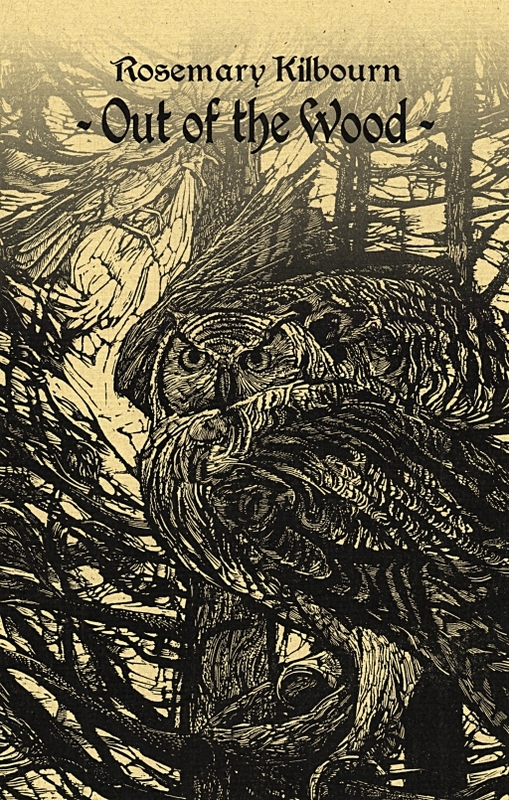 Out of the Wood presents eighty reproductions of wood engravings created by Rosemary Kilbourn over a period of fifty years, accompanied by short, elegaic fragments of text that elucidate the artist’s unique and influential aesthetic. The reach of Rosemary Kilbourn’s art -- primarily wood engravings and works of stained glass -- spans the country, having found welcoming homes in galleries and churches from Victoria to Montreal. Her engravings on wood have inspired and influenced a generation of artists that include Gerard Brender a Brandis, Wesley W Bates and George A Walker, but Kilbourn herself lives in quiet seclusion in a nineteenth-century schoolhouse -- known as the Dingle School by locals -- in the midst of a protected forest area on the Niagara Escarpment, and she’s lived there in the woods, a mile from her nearest neighbour, since she bought the property in the late 1950s. Out of the Wood presents a chronological retrospective of Kilbourn’s wood engravings, starting with samples of early work she completed in London in the 1950s and thence documenting the remarkable growth of her utterly unique style over the next five decades. 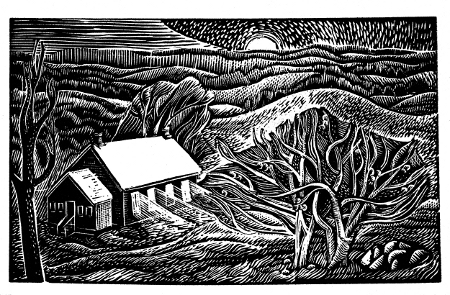 Each print is accompanied by Kilbourn’s own anecdotal commentary, offering insight into the art of wood engraving as well as reminisces about her life as an artist and as a resident of her beloved Dingle School in the Caledon Hills. Kilbourn’s engravings often depict local scenes of nature and countryside, and her affection for the rural life shines through in the sweep of her burins. The writing is fresh and humble, welcoming the reader into Kilbourn’s world and offering a rare glimpse into the core mechanics of a wood engraver. More than eighty prints executed over fifty years (from 1956 through 2006) tell the story of engraver Rosemary Kilbourn’s fascination with, and reverence for, both the practice of looking closely and the natural world that mostly occupies her attention. "The land has an intelligence of its own that Kilbourn acknowledges through the gaze of a mind finely tuned to expressing its vitality," says Tom Smart in his eloquent introduction to Out of the Wood. But hers is not the disembodied gaze of a distant observer: Kilbourn is of her surroundings. Continues Smart, "Her compositions insist that we belong to the landscape as surely as the trees and structures that blend into its topography." This theme of an integrated world resonates throughout many aspects of the work presented. And in the same way that Kilbourn’s glorious art cannot be separated from her rural Canadian lifestyle (which frequently forms its subject matter), so, too, does her book transgress genres--art, memoir, environmental study--as surely as it satisfies the criteria for each. Some of the finest examples of the prints collected here form a group of six engravings detailing industrial scenes to accompany a book by her brother William, The Elements Combined: A History of the Steel Company of Canada. In them, we watch men working at a blast furnace, and we also see the farm equipment eventually made possible by their work. Whether Kilbourn’s subjects are industrial, biblical, such as the wonderful Obedience of Noah, or closer to home, like the many views of the former schoolhouse she so gratefully inhabits, the compositions are packed tight, with something of interest in every space on which the eye can rest and register its regard. Throughout the book, the artist educates her reader using images and words. Kilbourn’s notes, opposite each print, discuss everything from her motivations to her tools and methods, forming an atypically friendly instruction manual. She writes with a graceful, straightforward style, as evidenced in this example taken from the preface: "Eventually I came to realize that some of the elements I most wanted to express in landscape were, to an extent, presupposed in engraving. The first was light. Brilliance comes from the contrast of the rich black printed from the surface of the block, while every cut into the wood I rendered as white. The process is not unlike drawing with light." Considering that comment and the multiple framing devices inherent in her compositions, it makes sense that Kilbourn has added designing stained glass to her repertoire over the past few years. Kilbourn’s sumptuous visions remind me of a fellow nature worshiper with an equally textured style: early nineteenth-century British Romantic painter Samuel Palmer. In the work of both artists, there is a kind of quiet ecstasy expressed that makes them a pleasure to behold again and again. At the Ontario College of Art in the early fifties printmaking was confined to lithography and etching. I didn’t know much about relief printing, but chose to make a linocut print for a museum project, as the best way to reproduce a brass rubbing. I then tried to make a Christmas card in the same way, but was frustrated by the bluntness of the line possible with the lino cutters. A fellow classmate, David Young, who was from England, offered to lend me his wood engraving tools for the next year’s card, and gave me the address of T. N. Lawrence & Son in London. After graduation, I spent the next two and a half years in London. One of my first visits was to Bleeding Heart Yard and the small room at the top of the wooden stairs that was the centre of supply for wood engravers worldwide. T. N. Lawrence, who, like his address, could have emerged from a novel by Charles Dickens, was enormously helpful, and showed me how to hold a burin and to sharpen it. He also sold me some small books, most notably one on Ravillious, from which to study. Back in Canada my brother William was just finishing his biography of William Lyon Mackenzie, called The Firebrand (1956), and he invited me to illustrate the book. This was really my learning exercise; it helped me to see where I needed more clarity in the cutting. It was also a disappointment, because the quality of reproduction was not good. The next year I found an old schoolhouse in Peel County where I decided I wanted to live. I had read an article by my new neighbour, Farley Mowat, on the injustice of the trial of Kiki, an Inuit woman, who, with her starving children, had been forced to defend herself from one of her people gone mad from hunger. I made an engraving of Kiki and gave it to Farley, who then asked me to illustrate the book that became The Desperate People (1958). Farley lent me his slides of the Inuit and their land, and a dentist’s slide enlarger, so that I could work with them as reference. My brother was soon working on his next project, a history of the Steel Company of Canada that was published as The Elements Combined (1960). Engraving had seemed appropriate for the Mackenzie history, because the method of illustration matched the technology that would have been common at that time. Engraving also seemed well suited to the starkness of the situation of the Inuit; and it now appeared to be the best medium for rendering the brilliant light-and-dark contrasts of the blast furnace and smelters. The publishers directed an excellent printing job this time, using electrotype, which was an exact copper reproduction of the wood, onto smooth white paper. About this time I began to use somewhat larger blocks for my own work. In 1962 the Grail Society made an attempt to improve the religious art that Catholics could have in their homes. Fred Hagan gathered together a group of printmakers for them, and we were all assigned subjects. I couldn’t imagine doing something small for the Resurrection, and so ordered a maple block of about 20 x 27 inches from the National Showcase Company in Toronto. (They still employed a few craftsmen from the time when engraving was used in commercial printing.) I found, however, that maple didn’t give me the precision that I wanted, so I asked T. N. Lawrence of Bleeding Heart Yard to airmail a boxwood block of that size. That really shocked him (not just the size of the block -- but cost of the airmail! ), but he made a beautiful block of large pieces that had been seasoning since his grandfather’s time. I later used both sides of the discarded maple block for other subjects. In 1966 it occurred to me that I might achieve more of the colour and abstract quality that I wanted in my painting if I switched to stained glass for a while. This seemed a logical transition since I like to work with a black grid of line against light in engraving, which is not unlike the lead and black grisaille that holds the light and colour in glass. I asked Yvonne Williams if she would take me on as an apprentice. Yvonne let me come into her studio one day a week over the winter to help her assistant sort and stick up glass pieces, and to watch work in progress. In the spring Yvonne passed a commission on to me, as she was going on a trip. That was the beginning of a new involvement that continued for more than twenty five years. Although I didn’t know this at the time, it is interesting to note that there were a few English engravers, notably Claire Leighton, who also later worked in glass. Both media are concerned with light, brilliant contrast, and black lines. Glass paint can be brushed and badgered into strong directional movement; or it can be cut into with thumb or brush when wet or with shaped sticks or worn hogshair brushes when dry. It can give explosions of light or controlled gradations, allowing lines and dots of brightness to connect and move together over disparate colours, bringing stronger light out of darkness than is possible with the unpainted glass. I always preferred painting in oils rather than watercolours because the underlay of transparent darks gives a base for the building of half tones and the final flecks of the highest key. Engraving also works from dark to light when the block is semi-darkened and the drawing developed in black ink over it, providing the contrast for the lighter half tones and whites that appear when the blond wood is cut. One of the many options provided by engraving that I most value is that half-tones can be made of movement. Half-tones can carry the design’s direction, which is experienced physically by the artist as the burin is thrust forward or the block turns on the sandbag. Sometimes it seems that the tool comes alive, as it discovers and insists on its own patterns of energy; then the lines and the still solids of black become an important scaffolding, since otherwise it is easy to cut too much. Black is the key to the brilliance of light, and it is in the balance of that contrast that engraving reaches its potential. The making of form can be a gift to the engraver, with the natural gradation from thin to thick that the tools, called burins, create in single repetitive cuts. Each tool has its own characteristic shape as well as an evocative name such as spitsticker, bullsticker, scorper or graver. On the hard endgrain wood, the sharpness of the burin makes precision possible, whether in a complex web of light or a simple black line. A cut line printed has an authority and presence not otherwise possible. The drawing and design of an image may pass through many preliminary stages, yet the actual cutting of the block can open up freedom of the moment, permitting the spontaneous play of the tool, running up to the blacks, inventing textures, or washing light over the greys. Wood engraving was, of course, developed primarily as a medium for reproduction. Nowadays that function is only a secondary advantage compared to the possibilities it allows for expression. Wood engraving is a relief printmaking process in which the raised surface of the block is inked and then prints directly onto paper, as could be the case with metal, wood or plastic (photopolymer). Other kinds of non-relief printing processes include planography and lithography, which are based on the repulsion of oil and water on a flat surface; intaglio, which involves cutting into the surface of a metal plate (in which case the lowered crevice holds the ink after the surface area has been wiped clean); and stencil methods such as silk screen. Wood engraving is a subtractive technique in which fibers are removed from the end-grain of a wood block. Wood engraving should not be confused with the cruder woodcut, in which the indentation is made on the cross grain, or plank-side, of a wood block. Wood engraving allows for a wider variety of cutting techniques than is the case with woodcut and is also more durable on a printing press. For this reason the medium lends itself well to illustration in publications, as well as to limited edition printmaking. Rosemary Kilbourn was born in Toronto in 1931. She graduated from the Ontario College of Art in 1953, at which time she received a medal for drawing and painting. Shortly after graduation she emigrated to London, England, where she worked and studied until 1956. Over the years, Rosemary Kilbourn has been active as a teacher, a wood engraver and a stained-glass artist. As an engraver she has created illustrations for a number of books. Among these are The Firebrand by her brother William Kilbourn, published in 1956 by Clarke, Irwin. She also produced wood engravings for the 1958 edition of Farley Mowat’s The Desperate People (Little, Brown), for William Kilbourn’s History of the Steel Company of Canada entitled The Elements Combined (Clarke, Irwin, 1960) and for The Shadow of the Year (Aliquando,1976) by Florence Wyle. One of Kilbourn’s most well-known engravings, based on an interpretation of The Fruits of the Earth by Frederick Philip Grove, was featured on a 17-cent Canadian memorial author’s stamp in 1979. Kilbourn’s engravings first appeared in the Canadian Society of Graphic Art annual exhibitions in 1958, and then again in 1962, 1964 and 1967. They were included in a show called ‘Prints and Drawings’ at the National Gallery of Canada in Ottawa in 1966, and were exhibited there again in 1969 in a show entitled ‘How Prints are Made’. Her engravings on religious themes were displayed at Regis College, Toronto between 1963 and 1966. Rosemary exhibited with the British Society of Relief Block Printers from 1973 to 1975, and participated in the Canadian Biennial of Prints and Drawings (1978). 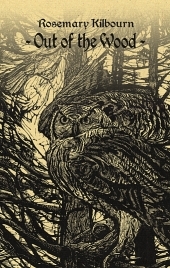 In addition, Kilbourn exhibited her wood engravings from 1959 to 1987 in various group and solo shows at McMaster University, at the Sisler Gallery (Toronto), the Lewis Library in Deep River, the Brampton Library and Art Gallery, the Alice Peck Gallery in Burlington and the Grimsby Art Gallery. She exhibited with the Society of Wood Engravers (England) from the late 1990s, and was awarded membership in the Society in 2001. Her engravings are found in major museums and galleries across the country. These include the Montreal Museum of Fine Art, the Waterloo Art Gallery and the Art Gallery of Greater Victoria, BC. Her engravings are also represented at McMaster University, the University of Guelph and the Universities of Regina and Calgary. 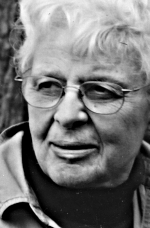 Rosemary Kilbourn was elected to the Royal Canadian Academy of Arts in 1977. She continues her long-term residence in The Dingle School, a nineteenth-century schoolhouse ensconced in a protected forest on the Niagara Escarpment north of Toronto.